10 bonus points if you can sing the title and know what movie it comes from. Today I woke up way too early on a Saturday and climbed in a cute little hatchback armed with roof racks and 3 awesome people for a little road trip to the ski slopes. 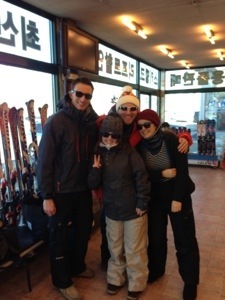 This was my first venture to the snowy slopes in Korea and maybe my last. 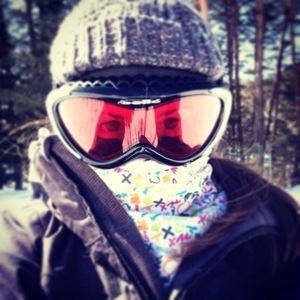 I enjoy skiing; mainly for dressing the part; but will never try to oversell my abilities. The bunny slopes are my home! This fact was proven to me as I wiped out on my first run on an intermediate slope since I was in middle school at good ‘ole “Mass o’ Nutten” in VA. Virginia is definitely not known for their skiing. As I type this on my iPhone I’m lounging in the lodge food court with my battered knee, foot, and pride as my friends brave the freezing temps for some ultra cool night skiing. Being the perpetual beginner skier that I am, I’m probably not the best judge of slope conditions, but I miss the shin deep powder on the slopes in Washington. The slick icey slopes camouflaged with a thin dusting of powder don’t seem like optimal conditions. Hoping to heel up quickly and try again, but maybe next season when the snow is fresh and plentiful. I’ve been skiing on/off for 4 years now. Will I ever graduate from the beginner slopes. Maybe snow sports just aren’t my thing…is it boating season yet? Besides the general conditions of the slopes I find it a little funny how the whole scene here is different. In WA the slopes are dominated by snowboarders and the over abundance of black and neutral toned ski clothing makes it virtually impossible to pick you your friends on the slopes. Korea seems to be the opposite as the slopes are highly skewed to skiers over boarders and the fashion here is bright bright colors and head to toe patterns. I thought my friend in the bright orange coat would stick out like a sore thumb but wrong! every 5th person was wearing the same color. Oh and the best is the matching couples and families. I saw an entire family of 4 in matching head to toe pink leopard print. Wish I got some pictures. Oh Korea, you never cease to surprise me.